The New York Rangers are making a big playoff push, but they'll have to figure out a way to beat their archrival if they hope to keep it going. 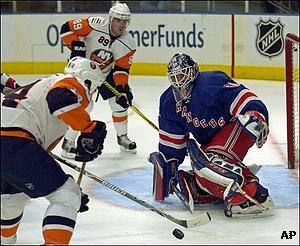 The Rangers will be trying to match their longest winning streak of the season on Tuesday when they open a home-and-home series with the New York Islanders, who will be without starting goalie Rick DiPietro. The Rangers (34-24-8) won their fourth straight on Sunday, beating Philadelphia 5-4 in a shootout. The Rangers, who are tied with Boston for seventh place in the Eastern Conference, are 7-0-2 over their last nine games. "Our team was really excited to play this game today," coach Tom Renney told the Rangers' official Web site. "Every guy was on the beam, and we found a way to get the win." The Rangers won five in a row Nov. 8-17, but matching that streak likely won't be easy. They are just 4-7-1 against the Islanders (31-29-7) since the start of last season, including 1-3-0 in 2007-08 as DiPietro has been in net for each of those games. DiPietro, though, won't play Tuesday because he has been away from the team following his grandmother's death. "Ricky won't be there tonight," coach Ted Nolan said Tuesday after the Islanders' pregame skate at Madison Square Garden. "It's just an unfortunate thing happening with his family, so he is going to take care of that first." Wade Dubielewicz will get the start, hoping to help the Islanders continue their dominance over the Rangers. "I don't know what it is," Nolan told his team's official Web site. "Maybe against the Rangers we've gotten the breaks at the right time. "This game is about work and creating opportunities. And it's about luck. I believe the harder you work the luckier you get, so we have to continue to work and hopefully we'll get some lucky breaks." The Rangers did win the most recent meeting, 4-2 at MSG on Nov. 29. The teams square off again on Thursday in Long Island. "We talk about emotion," Nolan said. "It's always there for the Rangers-Islanders games. You could play them on a Sunday afternoon in mid-June and the excitement would be there. "It's a big week for us. We have the Rangers back-to-back and then Philly on Saturday, but we can't focus on too much more than one game." The Islanders have dropped four of five to fall five points out of a playoff spot. They lost 1-0 on Sunday to Florida despite taking 53 shots, including a franchise-high 29 in the second period. The Islanders, who were coming off a 4-1 loss to Philadelphia, rank last in the Eastern Conference with 161 goals. However, they aren't far behind the Rangers, who have 170. "I think the most frustrating thing is letting four points slip away this weekend," Islanders center Mike Comrie said. "In similar games, we get a lot of shots, but I think we make the goalies look better than they are. We've got to get quality shots and get traffic in front of the net. Everybody's got to step up." Despite their lackluster offensive numbers this season, the Rangers have scored at least four goals in each of their last five games. Fredrik Sjostrom and Christian Backman, acquired in separate trade deadline deals last Tuesday, both scored their first goals with the Rangers on Sunday, and Brendan Shanahan and Nigel Dawes scored in the shootout. "Obviously when you come to a new team, you want to help in any way that you can," Sjostrom said. "This is a great team, a classy organization, and I am just so happy to be here." Steve Valiquette stopped 17 of 18 shots after replacing starting goalie Henrik Lundqvist, who had gone 5-0-1 with a 1.97 goals-against average in his previous six games.